Question: How Does a Flat Bat at Landing Effect Bat Speed, Ball Exit Speed, & Time To Impact? Using the Zepp (Labs) Baseball app and Pocket Radar Ball Coach , I wanted to employ the Scientific Method to analyze how a hitter’s “Flat Bat at Landing”, or toe touch, adds or takes away from key swing performance metrics including Bat Speed at Impact, Time To Impact, Attack Angle, and Ball Exit Speeds. A ‘Vertical Barrel’ at landing is anything more than a 30-degree angle. My background research is more experiential, rather than academic. It has to do with center of mass of the bat in relation to the hitter’s. A ‘Flat Bat at Landing’ pushes its center of mass behind the hitter’s. A human’s center of mass is generally around the belly button. To find the bat’s center of mass you can balance it between your thumb and forefinger. I’ve also observed when adjusting a hitter’s ‘Flat Bat at Landing’ to a more ‘Vertical Bat at Landing’, there’s a bump in Ball Exit Speed, which I measure at the beginning (before instruction is given) and end of a hitting lesson. My hitter’s also share they feel quicker to impact, have a little more ‘pop’, and that it’s easier getting the ball in the air. It’s also interesting to note that I see quite a bit of early barring of the front arm when the hitter lands with a flat barrel. I also see the hitter “wrapping the bat” around their head. In my opinion this is a compensation to manipulate the shifted center mass of the bat from behind the hitter. CLICK HERE to watch this video on how to fix a ‘Flat Bat at Impact’. In support of the Background Research above, I’m hallucinating that we’ll see a bump in Bat and Ball Exit Speeds, in addition to a reduction in Time To Impact. I also think that we’ll see a more positive move in the barrel’s Attack Angle. I broke each swing down into a couple steps: 1) Get to landing, 2) Pause for 2-secs, and 3) Swing. The reason for this was to control the bat either flat or vertical at landing. The two tests in the swing experiment were counter-balanced. Which consisted of eight blocks of 25-swings done in the following order ABBA BAAB. ‘Flat Bat at Landing’ was letter ‘A’, and ‘Vertical Bat at Landing’ was letter ‘B’. 200 total swings were completed in the experiment, 100 per test. Counter-balancing helps remove the “getting tired” and “warm up” factors. Experiment Day-1 on 7/5 we completed 150 total swings (75 ‘Flat Barrel at Landing’ & 75 ‘Vertical Barrel at Landing’). Experiment Day-2 on 7/10 we completed 50 swings (25 ‘Flat Bat at Landing’ & 25 ‘Vertical Bat at Landing’). Flat Barrel at Landing swing averages of the averages: 76-MPH Bat Speed at Impact, 26.5-MPH Hand Speed Max, .209 Time To Impact, -32* Bat Vertical Angle at Impact, & 8.5* Attack Angle. Vertical Barrel at Landing swing averages of the averages: 76-MPH Bat Speed at Impact, 27-MPH Hand Speed Max, .206 Time To Impact, 30.5* Bat Vertical Angle at Impact, & 8.5* Attack Angle. CLICK HERE for the Ball Exit Speed Google document. The findings? We saw a 2.01-MPH increase in Ball Exit Speed when holding a ‘Vertical Bat at Landing’. Based on the above Data Analysis it looks like my Hypothesis was proved right when it came to a boost in Hand Speed Max and Ball Exit Speed, and decrease in Time To Impact, but wrong when it came to Bat Speed at Impact and Attack Angle. I think the increase in Ball Exit Speed can be attributed to the decrease in Time To Impact. When we see ineffective movement at the Big League level, we have to understand that these high level hitters are succeeding despite ineffective movements, not because of them. Baseball Hitting Drills For Bat Speed Experiment: Jose Bautista "Blocking"
How Much Ball Exit Speed Does Pelvis Contribute To A High Level Swing? Joey…. nice research! It would be interesting to see if the tee height affects the ball exit speed. With our testing we got higher exit speeds on low tee heights and hits that were low line drives and ground balls . My gut is that the barrel position that lines up and stays on the pitch plane should get u the fastest bat speed and exit speed . Trout with his vertical swing is using gravity to his advantage more than Giancarlo Stanton who is very flat. That being said, the bat swings lighter for Trout than Stanton being used in this more vertical down to up swing. Trout might swing down to up more than any other hitter in MLB. In my sons case, the more he swings up, the shorter the carry because he launches it high with very little backspin. The flatter he swings the longer the carry. When we experimented with flatter swing he immediately hit the ball further and I’m sure the bat speed was the same or slower. Great research is the reason ur at the forefront of hitting science!!! Thanks Kyle! Great thoughts as always. Maybe that affirms what Perry Husband’s research says that the farthest HR’s with highest BES were hit down in the down. This could be due to a lengthening of the front arm which acts as a longer lever, more Inertial Mass versus Angular Velocity. Yes, I may have to experiment with high versus low tee using same mechanics…that may net interesting results 😀 Keep up the good work with Stephen and please say hi! 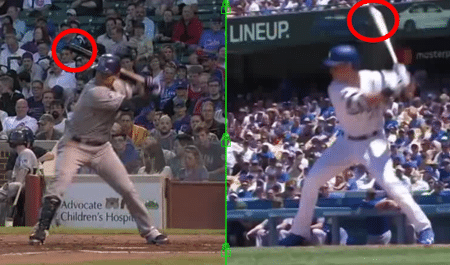 When I first reviewed your Part Two: Dramatically Reduce… training video some weeks back, it seemed to me that the “thumbs no higher than (and near to) the arm pit” approach effectively enforces a ~45 degree bat angle at landing. To get the barrel above the shoulder, it has to be significantly vertical if the hands are in that spot. For my older son, dropping the hands did exactly what you note… it pretty much brought an end to barring the front arm and appeared to accelerate his bat speed/power. Does it seem to you that, perhaps, Bellinger could be even quicker if his hands remained a little lower? I could see that elevating the hands above the arm put could produce a more loop-y – rather than swoosh-y – bat path. That’s awesome Alan! It’s funny, one of my readers commented on YouTube that he doesn’t buy into the fact that some MLB hitters can succeed despite ineffective mechanics, not because of them. He was defending Cargo’s flat bat at landing. Experiment aside, I’ve experienced the flat bat in my hitters as being an inferior hitting mechanic when looking at BES. And my hitters say they feel quicker to the ball with a more vertical bat at landing (and lowering of the hands). Keep up the good work my friend! If you get this than this may drive you crazy trying to figure this out. It’s in the hands ?….